With Total HRSolutions you can let OMNI handle your payroll, benefits, recruiting needs, and more. We are a very experienced human resources consulting firm that also offers clients the opportunity to outsource all HR business process functions. 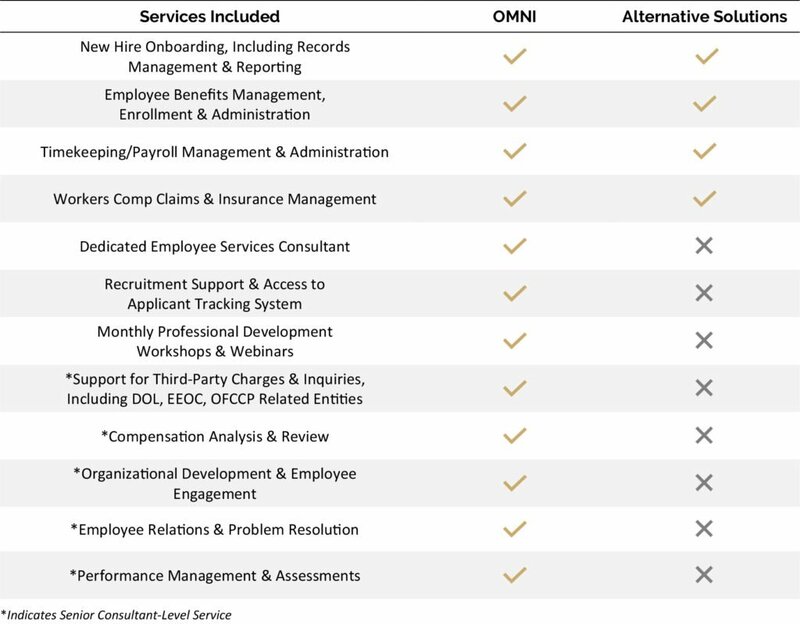 OMNI is not a payroll company, PEO, or insurance broker trying to add incremental value with human resources consulting services. Our relationship-first, holistic approach provides a true HR partnership with your organization. Our Total HRSolutions program affords the opportunity to “plug and play” into our human resources consulting team, including our systems, tools, technology, and processes. We can offer significantly more expertise and support at 20% to 40% less cost than most internally managed HR departments. We take care of employee services not just from a transactional standpoint, but as your HR partner. Each client organization is assigned a dedicated Senior Consultant and Employee Services Consultant team to handle all payroll, benefits, and support. Your team serves as your primary contact for “all things HR,” and our relationship-first approach ensures a positive ongoing partnership. Employee Services Consultant – In addition, each client is assigned an Employee Services professional who manages all help desk and administrative support associated with payroll, benefits, and related employee services. Our Total HRSolutions clients have full access to the technology, resources, and specialty expertise available through our consulting organization.